Picked fresh from the farm to offer your special recipient a bouquet exuding heartfelt happiness, the Let Me See You Smile Mixed Flower Bouquet is set to bring sweet sunny sentiments across the miles. 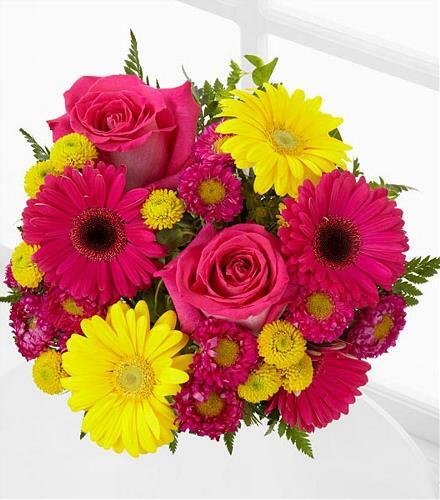 Hand gathered in select floral farms and boasting an array of bright, brilliant colors, including yellow, fuchsia, and pink, this fresh flower arrangement has been picked fresh for you to help celebrate a birthday, or express your thank you or get well wishes. Flowers Perfect for Any Occasion - Let Me See You Smile Handtied Bouquet.